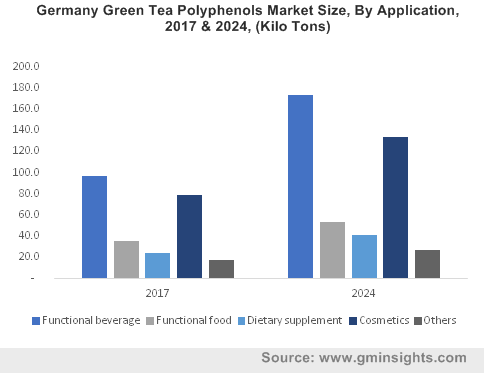 Tea Polyphenols Market size was over USD 180 million in 2017 and industry expects consumption of above 10 kilo tons by 2024. Growing awareness for healthy lifestyle owing to increasing chronic diseases including cancer, obesity, heart diseases, and diabetes will boost tea polyphenols market size. It is anti-inflammatory, antimicrobial, and antineoplastic in nature. The product has high epigallocatechin gallate (EGCG), antioxidants, and fibres which helps to increase metabolism and aids weight reductions. Increasing demand for functional foods and incorporating the product in them will drive market growth. Green tea polyphenols are unfermented owing to which they maintain their green texture and chlorophyll content. The products are derived from Camellia sinensis plant leaves which is cultivated in China, India, Australia and Japan due to its climatic and soil conditions. The product has increased usage in functional beverage and cosmetics industry, thereby enhancing market demand. Global tea market size is anticipated to exceed USD 55 billion by 2024. Tea is most consumed beverage globally due to occurrence of several nutrients including polyphenols, amino acids and less caffeine than coffee. Green tea polyphenols dominate the overall market due to its high extractable content. The product reduces the risk of heart diseases, diabetes, cancer, and neurodegenerative diseases. Increasing disposable income in Germany, Canada, France and the U.S. permits consumers to spend easily on premium organic products to enhance their lifestyle. The product has enhanced usage in smoothies, bakery products, dietary supplements and personal care items owing to presence of catechin, theaflavins and thearubigenes, thereby stimulating industry growth. Tea leaves are the only essential raw material for producing extracts, but fine plucking process and oxidation of leaves may enhance manufacturing cost. Japan, India, and Australia have strict government policies pertaining to fertilizers, pesticides, and soil fertility, which might hamper industry profitability, thus affecting price trends. Green tea polyphenols market size may expect gains over 7% in the projected timeframe. Substances including catechins, antioxidants and flavonoids help reduce formation of free radicals in body, thus protecting cells from injury and skin aging. Catechin composites in the product have numerous protective effects on neurons, potentially lowering the risk of Parkinson's and Alzheimer's diseases, thus enhancing industry growth. Black tea polyphenols demand may surpass USD 35 million by 2024. The product enhances heart health, bone health, and reduces high cholesterol & stress level, increases alertness, improves blood circulation and reduces asthma, thus propelling market growth. Tea polyphenols market size from functional beverage expects strong gains up to 8.5% in the projected timeframe. The product has antioxidant, antiallergic, hypolipidemic, anti-obesity, antidiabetic, and neuroprotective properties which has led to high demand in beverage innovation for obese and diabetic consumers. Paradigm shift for consuming organic beverages which are available in convenient container contents, size, shape, and appearance would boost product demand. Dietary supplements is anticipated to surpass USD 30 million by 2024. Growing awareness for optimal health, reducing stress, anxiety, and cardiovascular diseases consumers are looking for dietary supplements incorporated with extracts and preference for organic ingredients will influence consumption and drive market demand. Tea polyphenols market size from online retailing will surpass USD 160 million during forecast period owing to changing consumer purchasing patterns. The widespread utilization of the extracts is rapidly growing at faster pace attributed to easy online accessibility and ordering comfort at lower costs. Readily available information about suppliers and easy purchasing will upsurge market growth. Tea polyphenols market size from mass retailers will witness growth up to 7.5% by 2024. Retailers market the product by incorporating them with different applications including beverages, nutraceuticals, and personal care products. Retailers as well as wellness centres, play a vital role in promoting the product hence driving market growth. Asia Pacific driven by China, India, Australia, and Japan tea polyphenols market size may witness significant gains up to 8.5% in the estimated timeframe due to its increasing application in nutraceutical industry for its taste and antioxidant properties. China is leading manufacturer and exporter of tea extract due to less government regulations. Farming of Camellia sinensis is being supported in this region owing to its soil quality and environmental conditions making them hub of product extract outsourcing, thus enhancing regional industry growth. North America led by Canada and the U.S., is anticipated to surpass USD 85 million by 2024. Growing beverage innovations using product extracts due to consumer inclination for organic beverages and heathy lifestyles may fuel regional product demand. 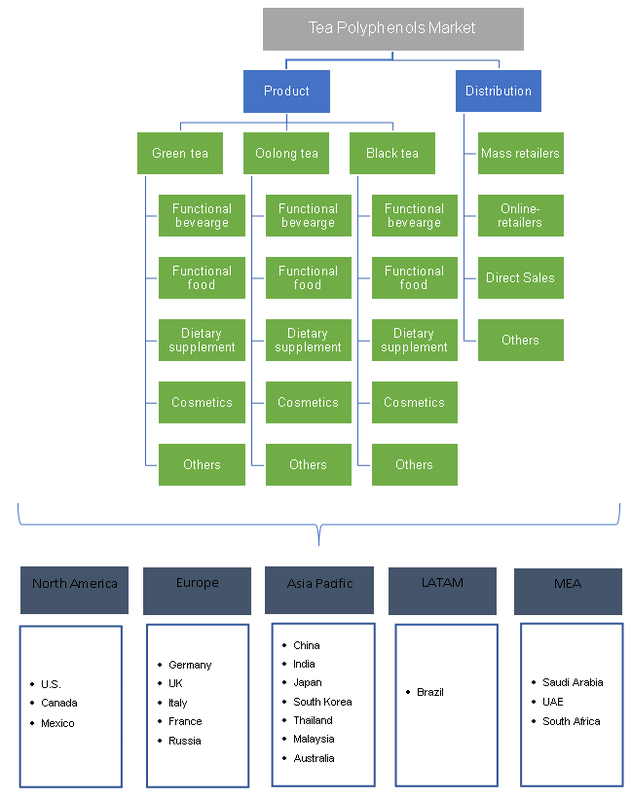 Europe tea polyphenols market demand driven by UK, Germany, Italy, and France may witness substantial gains of over 7% in the expected timeframe. Increasing consumer acceptance for organic cosmetic products due to their cultivation procedure of not utilizing harmful pesticides. This diminishes risk of skin irritation, damage, redness, and burns from harmful chemicals, thus driving regional industry demand. Global tea polyphenols market share is consolidated and highly competitive with key industry players including Berkem, Amax NutraSource Inc., Martin Bauer Group, Arjuna Naturals, ADM, Cymbio, FutureCeuticals, and Sabinsa. Manufacturers are investing heavily in product development activities to innovate new products for retaining their existing consumer base and to capture higher market share. Companies are expanding their regional presence in Asia Pacific region to make procurement easy and efficient for raw material supply. Industry participants are launching campaigns to get consumer engagement in product by organizing seminars and workshops for its health benefits. Companies are embracing open innovation to gain cost-leadership and fixed suppliers in early development stage. Tea polyphenols are extracts from Camellia sinensis which is cultivated in Asia Pacific region including China, India, Australia and Japan. The product is extracted from green, oolong, and black tea leaves containing antioxidants, ECGc, bioactive compounds and essential nutrients to keep mind calm and boost immunity & metabolism. The product is utilized mainly for its health benefits of preventing cell damage and removing toxins from body. Environmental changes, premium hand plucking process, and transportation process contributes in making tea polyphenols a premium product.